Each preparation has at least one label describing the nature of the specimen inside the container. The standard label contains this information. Scientific Name : The result of the taxonomic identification. Authority's Name : The name of the specialist who identified the specimen. Also it was possible to put the name of the collector, curator, and/or the person who re-identified. Date : Usually the date of the collection. However, there are other possibilities, e.g. the date of accession, the date of re-identification. Scientific Name : Since most of the preparations were made before 1970's, some of the scientific names do not exist. In this case, we have put the possible current name, as the list of "Relating Name", which has been found from various sources. However, the current synonym system of the nomenclature always follows the succession of type specimen's name but it should not be simply applied to the varieties of old taxon concept. Authority's Name : 3,734 out of 8,396 preparations possess authority's name on the label. Date : 8,357/8,396 preparations possess, at least, information about year on the labels. Most of the dates written on the old preparations, which are listed in the primary catalog, seemed to be the date of accession. 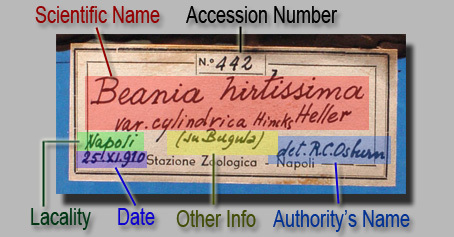 Accession Number : Most of the simple digits (1 - 1188) on the labels are the accession number of the primary catalog. Also the digits divided by slash (##/###) on the labels are the other accession number used by Parenzan. However, the digits written on the other label (1461 - 2432) are not accession numbers but the serial number used in the 3rd Museum Catalog in 1918. The 4 digits starting from "SZ" initial shown on the label of Porifera are the code used by the student working in the museum. The Zoological Collection are mainly contained in glass jars, thus it is hard to read the information written on the labels without rotating them. In this database, it becomes possible to read the label information using rotating movies of each preparation. Supported by Hosei Science Center, Italian-Japanese Biological Society and Stazione Zoologica di Napoli.